Web forms are supposed to be the fundamental building blocks of websites. They are meant for gathering information from website visitors during lead generation or the sales process. Forms are an integral part of a website and you are required to input important information about yourself. Having web forms certainly is of great importance for each and every site as forms help in generating active interaction between the site and its users. Forms could be instrumental in generating effective conversions that could be the yardstick for the site’s overall performance and success. Some web forms end up being barriers while some others mean smooth business and propel a visitor through the entire process effortlessly. The main difference between these two groups of web forms lies very much in the usability of the web form design. People would be devoting some of their valuable time in filling out a form on a website. So it is mandatory to make sure that they get a good UX. As per latest research provided by Clutch, the B2B reviewer, 86 percent of people end up filling out at least one web form every week (https://themanifest.com/web-design/5-tips-designing-perfect-web-form). Concise and clear web forms would enhance the lead generation endeavors, customer retention, and conversion rate. 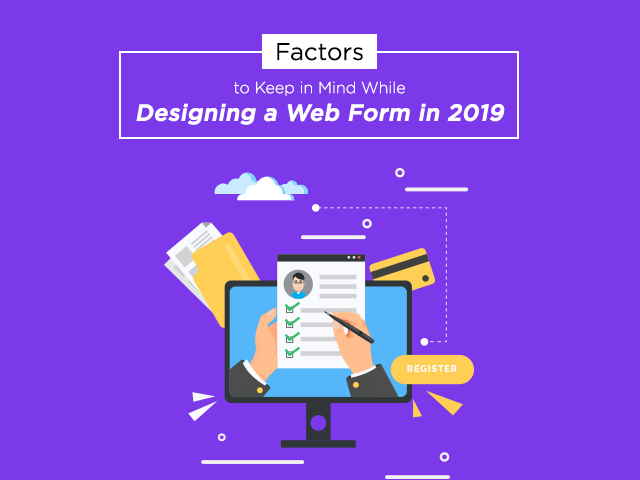 It is necessary for all web form designers to take note of the fact that even though contact forms are regarded as popular, they convert at just 3 percent. Here are a few important factors to keep in mind while chalking out a web form. You must have a concrete plan before you start designing the web form. You must consider examining what would work best for you. It is a clever idea to pick the coding language that would be convenient and comfortable for you so that you could use it. Try to find out which website form is more effective and the type of form that is actually required by you. You need to understand what would make your form design work. Web form designing could benefit from creativity. Just because it is a web form, it does not necessarily mean that your form design is limited to the information that would be provided by the website visitors. You must design it in such a manner that it looks different, inviting, and definitely fun. If you instill an element of fun, the web form would look warm and friendlier. Your web form must look like it is essentially a part of the entire website by incorporating a design that demonstrates the same personality. A good designer should strategically place attractive illustrations and interesting elements to make the web form look exciting and far more inviting. It is best to use simple language while designing web forms because you must make sure that the users will face no issues in understanding the instructions. Users need to clearly understand what they are asked to do. You must not use complicated words that would mislead the user if he does not have a good hold over the language. Moreover, if you are using complex words then some users may be compelled to leave the form as it is or skip that part simply because they were unable to understand the contents of the form. It is crucial for you to be simple and direct so that there is no difficulty in understanding. You need to understand what you are doing. Likewise, you must use effective tools to download Instagram photos. In case you are actually looking for a huge amount of information, it is advisable not to make the web form look excessively bulky and difficult to fill in. Usually, web visitors would take a look at a bulky form and leave the site at once thinking that they would require devoting a tremendous amount of time to fill up such a bulky form. Therefore, your main aim is to make it appear far more manageable simply by breaking it into smaller sections. That will give a simple and organized look to the web form. If the form does not look bulky, your web users would not be turned off and they would fill out all the relevant information that you are looking for. You must make sure that the information that you are seeking from your web visitors is arranged properly. You must choose carefully all that you need to ask and you need to strategically place and organize all connected and relevant information close to each other. For instance, your form must ask, first of all, your visitor’s name and then ask for the email address and not vice versa. You must carefully evaluate and assess the relevance of all the information you are looking forward to. It is critical on your part to alert the users and indicate that they have made certain mistakes while filling out the web form. In case they have accidentally skipped some items or made some errors, you could come to their aid by simply validating the information. Users may be careless at times and may make mistakes while entering data. You need to make sure that the correct information is saved. The user would feel exasperated if he is asked to fill and complete the form once again. In fact, there are several people who are extremely impatient and do not like filling out forms. So, make things as easy as possible for people who need to fill in forms. We have discussed some of the critical factors to consider while designing your web forms. Designers must pay attention to these while creating their own unique web forms. Make the web forms easily accessible to your audience. If you keep all the factors in mind, users will have a clear understanding regarding each segment of the form that requires filling in and website owners would easily get the important information they are looking for.